Send a Ministry of Caring bread card to share your thoughts with others. Choose one of these three meaningful ways to express your feelings while serving God’s poor. Remember someone who has touched your life and is no longer with us. 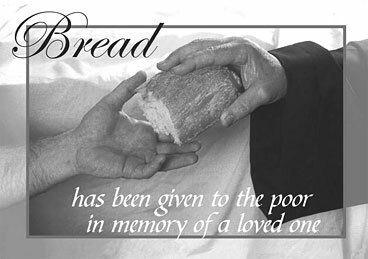 A bread card offers comfort to the recipient and supports the poor and homeless as they strive for a better future. Are you looking for a unique way to acknowledge a birthday, graduation, wedding, anniversary or other event in the life of a loved one or friend? Bread cards are a wonderful alternative to standard greeting cards. Personalize the card to suit your needs and share your joy by helping the poor. During the special time of the year when we focus our thoughts on peace on earth and good will toward all of God’s children, send your friends and loved ones greetings with a Ministry of Caring holiday season card. Extend your hand to those in need as you reach out to friends and family. To receive our practical and thoughtful bread cards, please contact Sue Harris at 302-652-5523 or sharris@ministryofcaring.org. A free will offering is appreciated. If you would like further information about giving to the Ministry of Caring, please call 302-652-5523 or send an email to the Development Office.